We are proud to offer an alternative to traditional high school, St. Johns Learning Center. This is a small, alternative high school where students who struggle can receive one-on-one support and guidance through the high school years. Students work in a computer lab setting to meet all the general education requirements of a traditional high school. Classes are very small so students can get the assistance that they need. 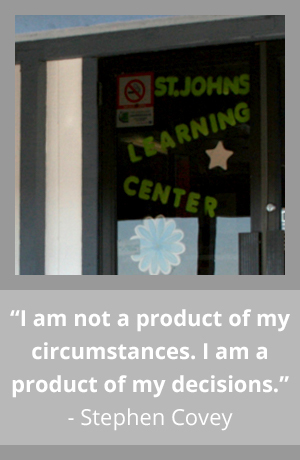 Admission to St. Johns Learning Center is determined on a case-by-case basis. If you think your child would do well in this setting, please contact us at (928) 337.2255. Is the St. Johns Learning Center separate from St. Johns High School? Can students at SJLC participate in NAVIT and athletics? Isn’t SJLC just another “online” school like the charters? Can anyone enroll in SJLC? Can I do work at home while enrolled in SJLC? Yes. The St. Johns School Board voted to create a fourth school in St. Johns, aimed at serving those students who are not enrolled in SJHS. The SJLC is separate from the traditional high school in almost every way. Yes. We encourage students to participate in NAVIT and athletics. These provide great opportunities for students to be successful, and success is what SJLC is all about. No. SJLC is modeled after a program that has been in use by other districts in Arizona for more than a decade. The program has an online computer-based element, but we supplement this with research and projects aimed at helping students find connections between what they are learning and what they can use that knowledge to accomplish. We created this program to serve students not enrolled at SJHS. With this in mind, there is an enrollment process. After we receive the application materials, we will hold an interview to identify how we can best serve the student in the program and if it is appropriate for their needs. There is a homework component which requires students to do some work at home, but students may also do some of their classwork at home. Determining what is best for the student is part of the interview process, and we have a variety of tools we can use to help students succeed.